Somebody became quite the bishoujo. Wow, what an episode. Only 5 more to go. There was so much more to see then the manga, like the eye staring thing from the king & the bandit, that helped spice up the atmosphere. Course I think a few things were changed from how the manga told it’s stories. Especially when it showed Xin in a meeting before he lost in defending the bridge area. Oh well, guess they had to make some alternate rearrangements around. But man, I can’t tell what episode number would star the side story from chapter 250? Tougun. Since that story was over 30 pages long from being a special. I’m looking forward to that. Maybe it comes after 35 since the anime version does take in almost 4 chapters? Who knows? PS to strik3agle, just look up Kingdom on Nyaa, to get Nyaa Torrents, look up Kingdom from Anime-Destiny, there should be a list or a complete season one work. That’s all, hope it helps. New ep, Thanks a lot! 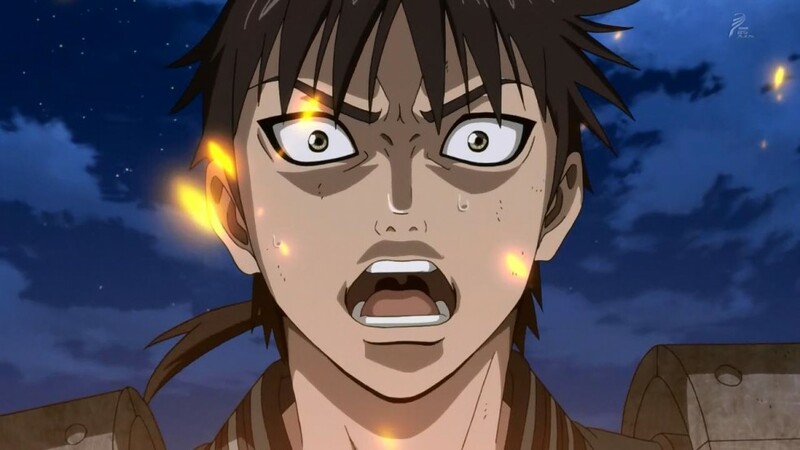 XD Btw, in need of seeder for Kingdom S1 ep 8 and 34… Anyone please? Thanks.